In our previous posts we have seen interface of matrix keypad and 16x2 Lcd display, in this post we will use both and we make a simple calculator project. AIM:Aim of the project is to make a simple calculator which can perform addition, subtraction, multiplication and division. When we apply power, Lcd displays "CALCULATOR" for few sec, next "No1:" is displayed on the LCD's first line and user is expected to type first number and then press ENTER key, next "No2:" is displayed then user is expected to type the second number and press ENTER key. After user press Enter key, "op:" will displayed on the LCD and it is expected that user enter the operation key i.e for addition "+" for subtraction "-" for multiplication "x" for division "\" . As soon as the user press corresponding key, result will be generated and displayed on LCD. Again loop will be repeated. Note from the above circuit diagram that there are many unused keys. I have left it because if you want to make this calculator to perform more operations like sine, cos, tan , etc then include them by extending this project. 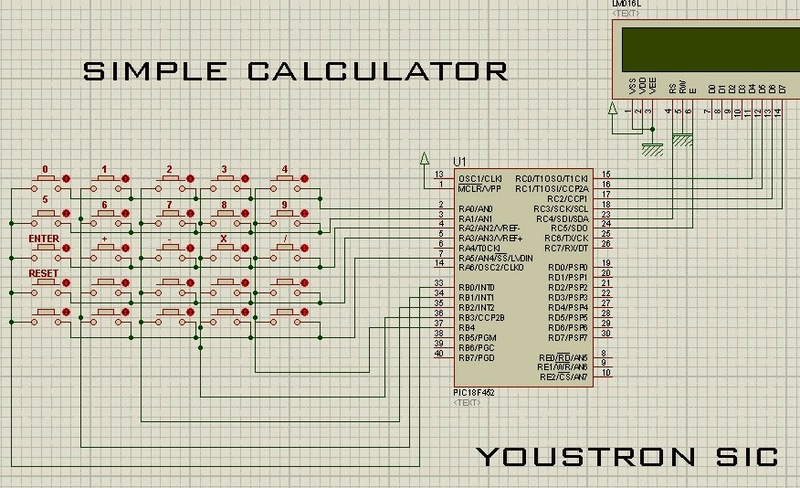 It is not necessary for me to explain code again because I have explained in my previous posts i.e Interfacing 16x2 Lcd to microcontroller and Tutorial on 5x5 matrix keypad, but one thing i need to clear. Look at the line 33 in main program above, in which " asm reset" resets the microcontroller. Here 'reset' is an assembly instruction, we can use assembly language instructions in between MikroC language code using keyword 'asm'. Is it possible with this circuit 7 segment display? hello excuse me could pass such files and the simulation code ? Thanks a lot .. It will help us in our lab assignments. Here is another C program to make calculator using switch statement. Can we have a code like this in assembly language?